The blockade of the Gaza Strip continues to restrict the free movement of people and goods. Industries are devastated and resources are lacking as a result. Gazans are facing severe poverty, with children suffering from malnutrition in particular. The illegal Separation Wall and Israeli settlements divide the West Bank, including East Jerusalem, disrupting people’s access to health, education, and work. Tensions among Jerusalem residents have been running high in 2016, due to a few Palestinians engaging in violent attacks on Israelis, as well as the Israeli military implementing random checks and engaging in deadly violence towards Palestinians. The Gaza Strip is called an open-air prison, with eighty percent of the residents dependent on aid. The negative effects of the 2014 Gaza War are still strongly felt in 2016: the destroyed power plant and lack of resources have led to electricity only being provided 4 hours a day, hospitals not being able to sufficiently treat patients, and water being polluted. 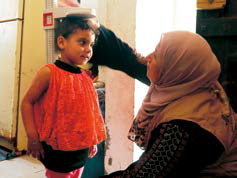 Together with Ard El Insan and local women volunteers, JVC has worked to deliver nutrition and health education to residents of Bir al-Naja in Jabaliya City, as well as provide health checks to children there. Volunteers trained as child health advisors conduct home visits to families with children five years and under, providing them with individual counseling as well as nutrition and cooking lessons. 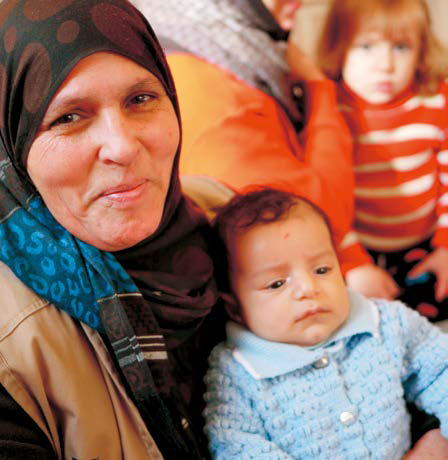 In one year, the program supported 4,900 women and approximately 2,600 children. The program’s final year saw women as strong agents, working to improving children’s malnutrition in their communities. Women who have completed training to become health advisors (Gaza Strip) . East Jerusalem is divided by the separation wall unilaterally built by Israel, disrupting people’s livelihoods, particularly for Palestinians living on the Israeli side of the barrier. While the Palestinian Authority is unable to provide public services to areas beyond the wall, the Israeli government is responsible for land confiscation and neglect. The Israeli government does not allocate budgets according to the size of the Palestinian population, leading to deficiencies in health and emergency services, infrastructure, education, and garbage disposal. JVC works in East Jerusalem with the Medical Relief Society to build a community framework of resolving health and hygiene issues centering student health committees in 16 schools. Committee members receive training and consider public health issues in their community together with civil society groups, planning and implementing projects based on their own ideas. For example, they work with their village council on many activities, including the installation of garbage bins and emergency rooms in the event of a natural disaster. These efforts are meant to deepen connections between youth and their community and build an environment that supports them, including their self-esteem and sense of achievement. Through this program, youth have shown improvements in tests measuring their resilience and ability to bounce back in the face of violence. Junior high school members of a health committee in Hizma(East Jerusalem) . Across the globe, many people are making their voices heard and taking action against Israel’s policies of military occupation. We believe we need to work not only with civil society groups in Japan, but also with joint organizations of Palestinians and Israelis, as well as gather and disseminate information about areas suffering from the most severe violations of human rights. As such, JVC supported the jointly run Alternative Information Center as it designed a workshop for Palestinian and Israeli workers. The workshop introduced the potential of Palestinian workers joining an Israeli labor union to defend their rights working in Israeli settlements. Furthermore, JVC supported the construction of a water reservoir in Beit Ummar, a village located in Area C that suffers regularly from Israeli settler and military violence, to help stabilize the area’s agriculture.